For this blog the way we want to use if 2b. This allows to create the skin once, deploy it to a server and use it in every other application. 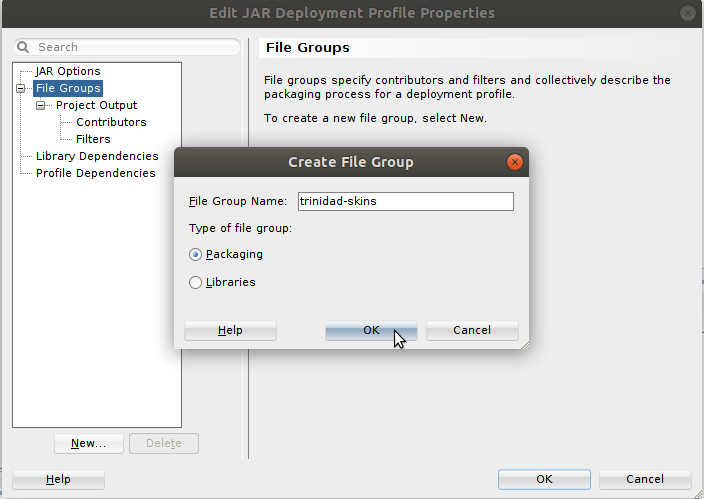 In the next paragraph, we try out option 1a to show the problems when reading resources from a jar file. Here we create a jar file containing the skin and additional resources like images and deploy it directly to a WebLogic Server as a shared library. The advantage is, that other applications can use the skin and other resources directly and that the jar can be versioned to allow different versions of the same jar on the server. In his article, Frank suggested using the command line jar tool to create the jar. I show how to use JDev to create the jar with the needed structure and how to deploy it to a server as a shared library. A sample application is used to use the skin and to show an image load from the jar. In the article Frank instructed to create the needed folders yourself and copying or moving the files to the new structure, then to use the command line to build a jar from the structure. I’ll show how this can be done with a special deployment descriptor from within the project. 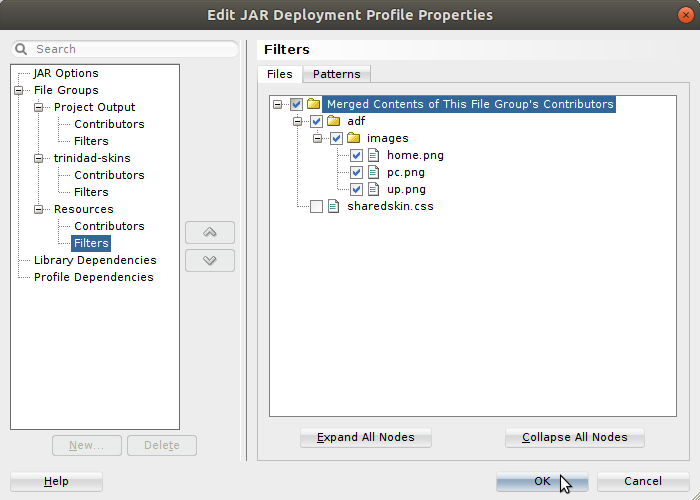 The image below shows the needed layout of the final jar file. Finally, we can deploy this jar to the WebLogicServer. In this case, I use the integrated WLS, but it can be any stand-alone WLS too. 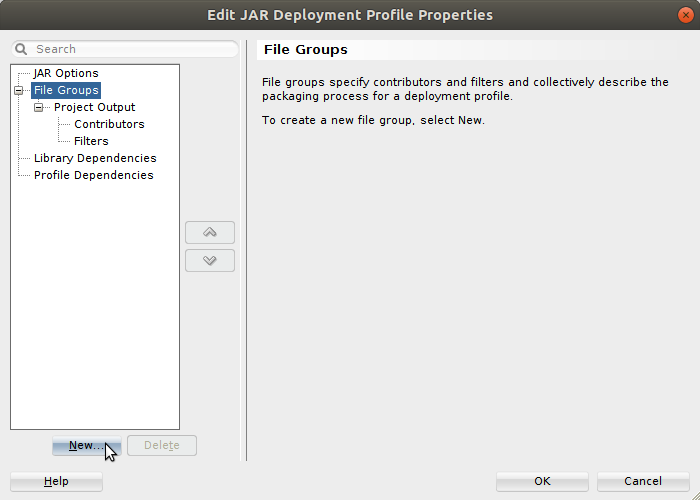 Now the jar file is deployed on the WLS as a shared library and can be used for every application on this server. 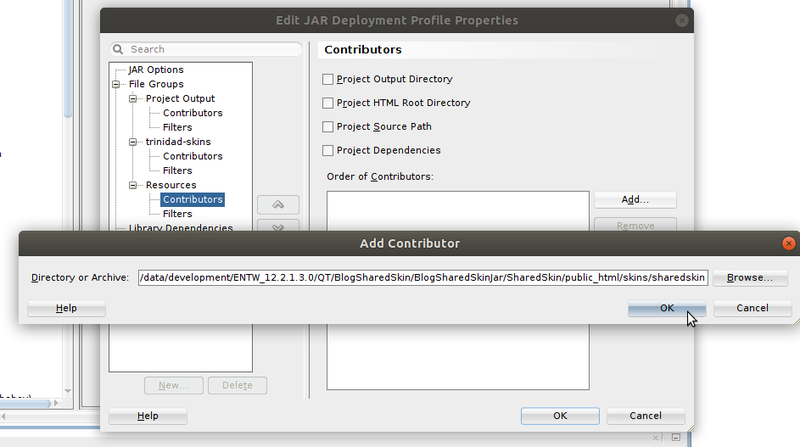 We use the existing application from part one to consume the jar skin from the shared library and show the images deployed with the jar. The page should now look like no skin is used at all. This proves that the shared library with the skin and the images are working correctly. The unset checkmark prevents the jar from being packed into the WAR or EAR file. It’s just used in the IDE. That you can’t see the images is normal as there is no full server to serve the images to the design view. In this mini-series, I showed the problem when creating a skin as ADF Library and trying to share it on a Weblogic Server. 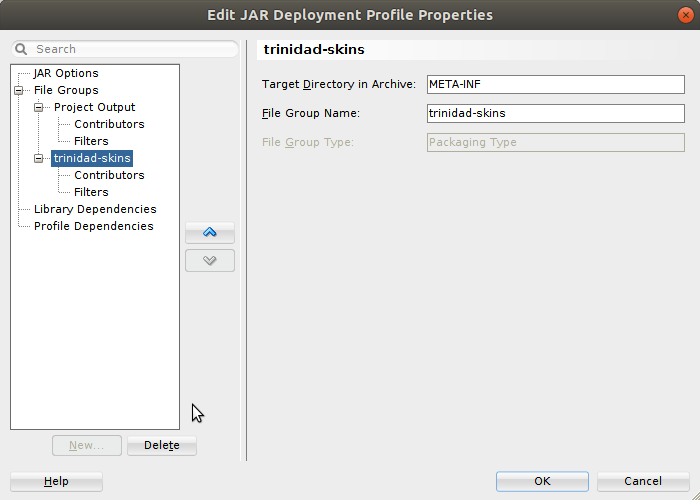 Then I showed how to create a deployment descriptor for the skin and other resources and how to deploy the resulting jar to a WebLogic Server. The sample application can be downloaded from BlogSharedSkin. The sample was created by using JDev 12.2.1.3 but the same technique can be used in any 12.2.1.x JDev version. There is no database connection needed. In earlier versions of JDev, skins have been created either by pure code or by using the free Skin Editor. 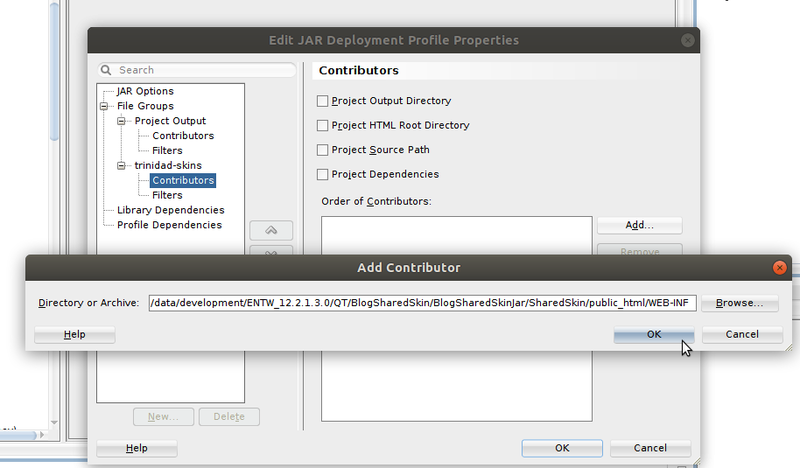 However, since JDev 12.2.1.x the skin editor has been integrated into JDeveloper itself. 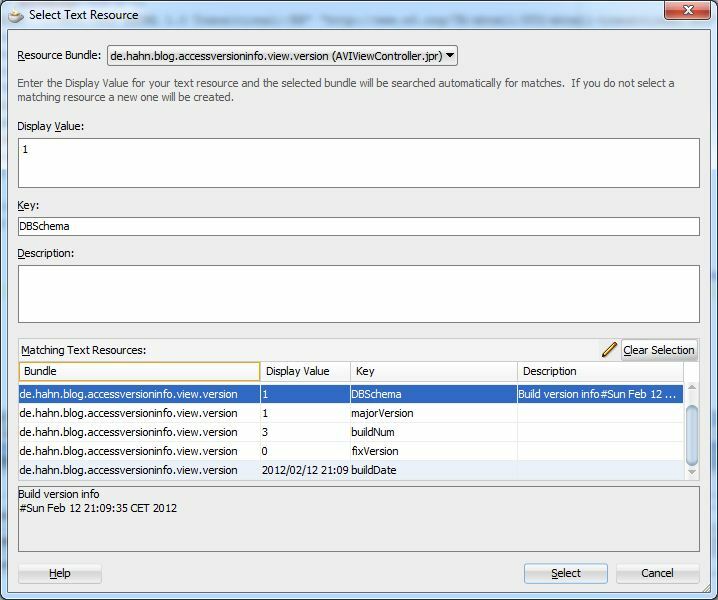 A couple of questions in the ODC JDeveloper space are about how to create a skin with JDev which can be deployed as a shared library to a WebLogic Server. I gave this a try and it turned out, that you can build an ADF library jar from a skin project but you can’t use images to this jar which you might want to use in the application. In this blog, I’ll show how to create a skin with resources like images and how to build a jar file from the skin together with the images and deploy it aa s shared jar to a WeblogicServer. The first part is to build a small skin project. The project we use to create a minimal skin, just to show that the skin is changing something. Then we add some images to the skin which we want to use in the application which uses the skin. Such images can e.g. used on an af:button component. This will create the needed css file and the descriptors which define our skin (trinidad-config.xml and trinidad-skins.xml). and click ‘OK’. The remaining dialogs you can just click ‘OK’ or ‘Finish’. This will create the jar in the ‘deploy’ folder of the project. For this blog, we want to use option 2b. This allows to create the skin once, deploy it to a server and use it in every other application. In the next paragraph, we try out option 1a to show the problems when reading resources from a jar file. So, the shared skin is working. Well, yes, but what about the images we added to the ‘sharedskin’? The reason is that the resource servlet expects the resources in a different path inside the jar. Every resource which should be read from a jar should be in a folder named ‘META-INF’. 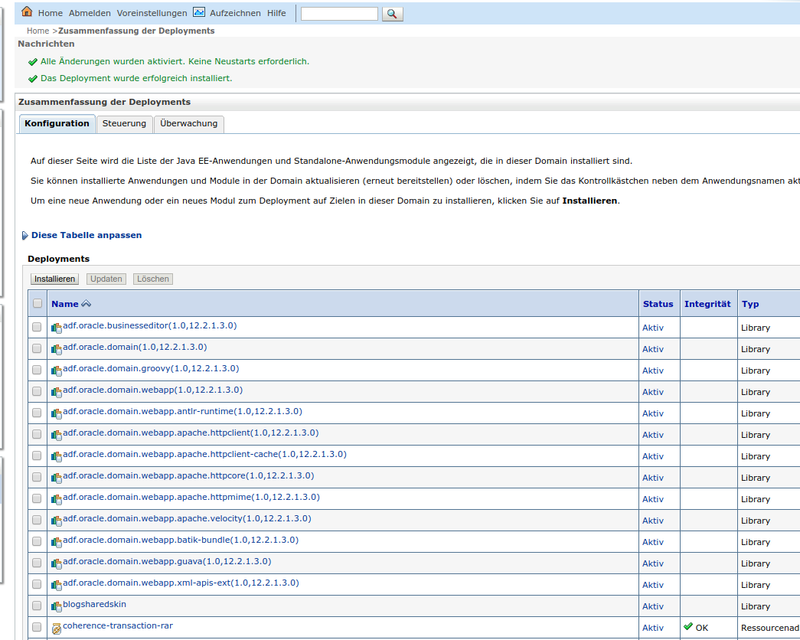 The problem is that we can’t change the layout of the ADF Library. 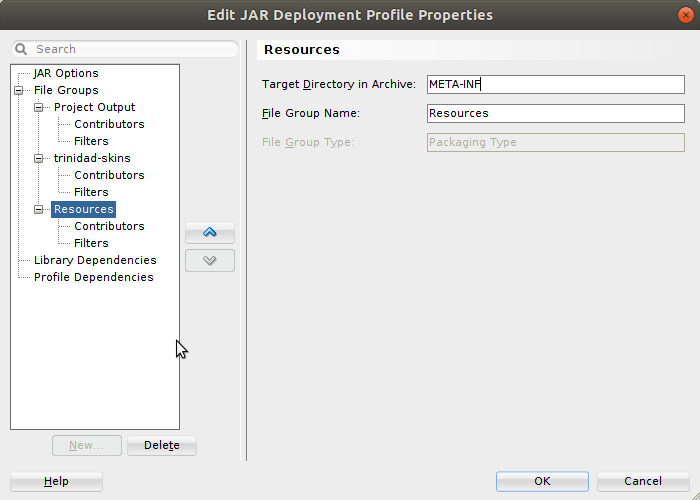 When you create an ADF Library there is no option to make any changes to the content of the jar. The conclusion is that using a skin in an ADF Library is problematic if there are other resources which you need to share. In the final part 2 of the series, we see how the skin can be shared with other applications. For a training I’m preparing I had to implement a POC on how to access an external REST API and to make it available in an ADF application running in the Oracle Java Could Service. This task sounds pretty easy, nevertheless it’s best to see this working before starting a training which in the end will not work. I decided to use Spotify public available REST API at https://api.spotify.com for this task. I started by creating a simple Fusion Web Application using JDev version 12.2.1.2.0. To this project I added a custom model Project which I later used to add the REST DataControl pointing to the Spotify track search API. As this post isn’t about how to create such a project and use it in your normal ADF application, I spare the details here and write this up in another blog post. javax.net.ssl.SSLKeyException: Hostname verification failed: HostnameVerifier=weblogic.security.utils.SSLWLSHostnameVerifier, hostname=api.spotify.com. Under advanced options , change “Hostname Verification” from “BEA Hostname Verifier” to “Custom Hostname Verifier”. 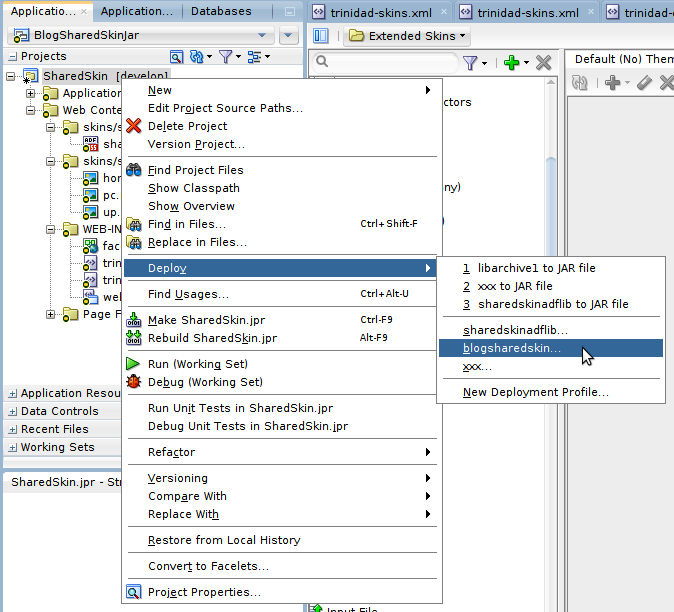 After this the sample application will run on the local development machine or an stand alone webLogic Server. 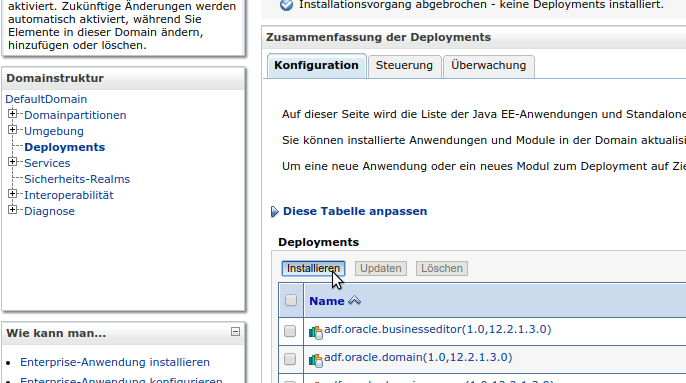 Now the fun part begins, making the application run in the Oracle JCS. Here I started with setting up a new Java Cloud Service with a WebLogic Server of version 12.2.1.2 and deployed my local running application to this new JCS. which did not work either. The interesting part is that you can do the same from the DBCS command shell and get the right answer. are allowed as destinations and my rule should allow the managed server (source) to access the PUBLIC_INTERNET or allow access to https protocol port 443.
with source set as the managed server and destination the new security list. After that the access to the external REST API works. Tweets, blogs articles are coming from all directions as the next ‘bug fix’ release of JDeveloper has gone public. I’ll skip the download and install stuff for now, as there are some posts on this already. First thing I normally do is to read *all* documentation (just kidding). Well, I at least read the Release Notes and What’s New documents. If you want to configure a WebLogic Server 10.3.6 domain to test an ADF application , you will need to install WebLogic Server 10.3.6 and use the 10.3.6 JRF template to add the ADF runtime libraries. This made me think about the convention that applications developed with JDev version 11.1.1.x should run on a WLS version 10.3.x, where x should be equal for JDev and WLS. This statement still is true (I guess) for all environments beside JDev development. I’ll hope we don’t find a use case where this WLS version mismatch is the cause of error. 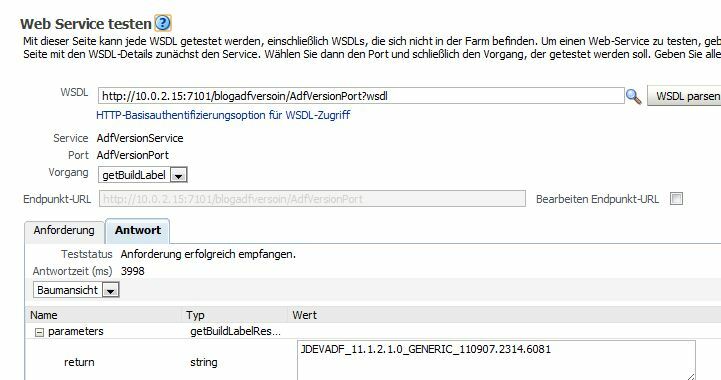 My last presentation at the German ADF Partner Community showed how to put a version number into an application ear and allows two versions of the same application to exist on a managed WebLogic Server. One question I got from the audience was how to show this version in the UI of the application. This blog post shows one way of doing this. For those readers which do not know how to put a version number into an application EAR before deploying it to a WLS, lets start with this. 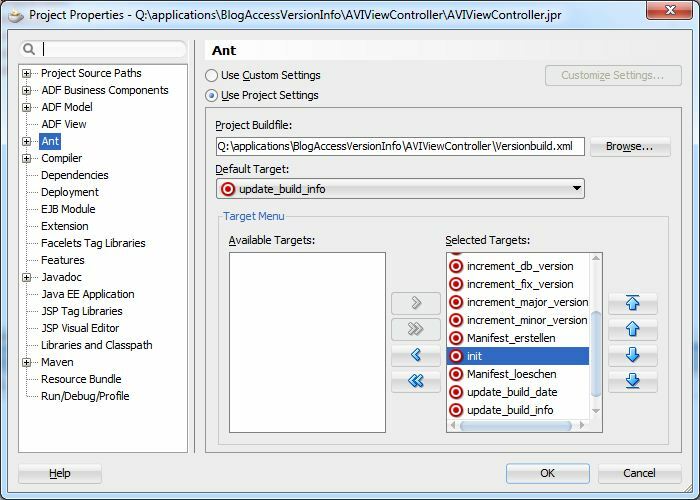 Andrejus Baranovskis has a blog post How to set EAR Version for ADF Application on WebLogic about this which uses a more hand coded approach. Edwin Biemond showed a small ant script to do is. I will show you a different solution using ANT. Now that the project has a version.properties file (at src/de/hahn/blog/accessversioninfo/view/version.properties) holding information about the current version of the application we need a way to access this information on a page in the UI. 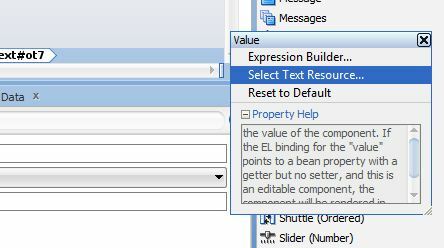 As we are using a property file we can bind this file as resource bundle into the project and access the parts (properties) with EL. To add the version.properties file as resource bundle we open the project properties, select the “Resource Bundle” node and then set the properties from the bundle as outputText onto the page. Make sure that you select the right project when you add a property file. 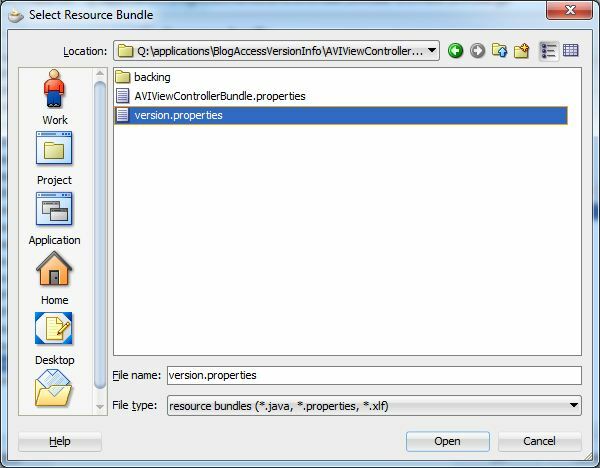 As you see the name of the resource bundle is set to “aviviewcontrollerBundle” (the default bundle name). This happens if you don”t already have a default bundle defined which contains a key value pair. You can rename it to e.g. “versioninfo” to make clear what the bundle is used for. In this case you have to change the EL to access to properties too. The sample workspace can be downloaded from here BlogAccessVersionInfo.zip. Please rename the file to ‘.zip’ after downloading it! It was build using JDeveloper 11.1.2.1 and uses the HR schema. As a developer and architect I’m working with different version of JDeveloper and WebLogic servers. Sometimes I switch version multiple times a day. Most customers have multiple deployment targets (development, QS and production) on different Weblogic servers. This make it sometimes hard to keep track of the different versions. 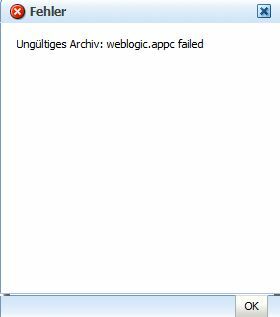 I searched for a way to find out which ADF Runtime is installed on a given WebLogic server. If you look at the console application or the Enterprise Manager application you’ll see no difference. Sometimes you can guess which version is running if you know which other application version is running under which server version. Still there should be a better solution. Searching (my friend Google) the only way I found was to check the MANIFEST.MF of a specific jar on the server. As I don’t have access to a command shell on all servers this method won’t work for me. Then I stumbled upon the PrintVersion class (http://docs.oracle.com/cd/E15051_01/apirefs.1111/e10653/oracle/jbo/common/PrintVersion.html) which prints the BC4J version. A bit more digging led to the class oracle.jbo.Version which was mentioned in a really old blog entry from 2003 (http://radio-weblogs.com/0123729/stories/2003/07/10/associationConsistencyOnNondetailVos.html). This class is still available and hold information about the ADF version like the build label and BC4J version. Some of the info is stored in static final variables and only one public method Version.getAsAtring() is available. This class is the solution I was looking for. 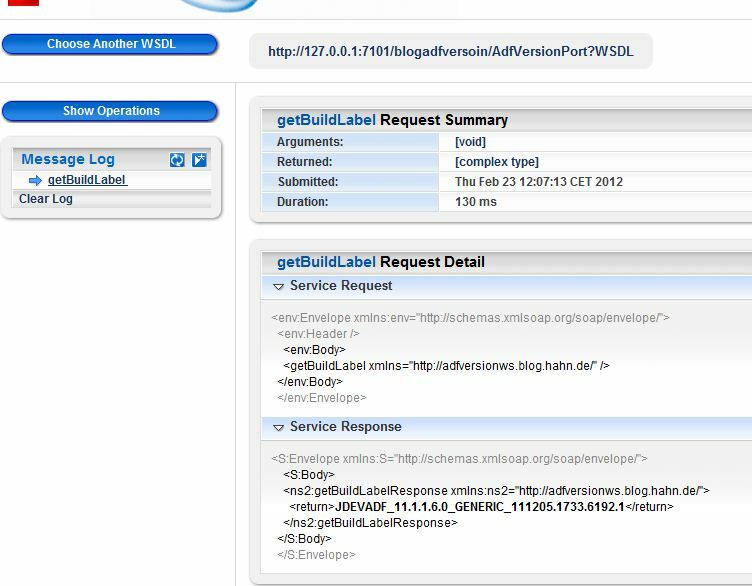 As I couöd not build an ADF application, but needed a solution which is deployable to a managed server, I decided to implement a web service which returns the BC4J version and the build label of the ADF Runtime Library deployed ton the WebLogic server. To make the web service independent from the Jdeveloper ADF Runtime I reference the ADF Runtime Library which is deployed on the server as shared library ‘adf.oracle.domain’. For this I created a weblogic-application.xml descriptor and add the library ref to it. The ear should be deployable on all 10.3.x WebLogic servers. Please rename the file to ‘.zip’ after downloading it! There in no DB connection needed. I run into a strange problem today while working an a presentation about a ‘One Click Build’ process. Part of the presentation is building an EAR archive which can be deployed to a WLS server (10.3.5 + Sherman + update2) running under Ubuntu Linux 11.04. The application is build with JDev 11.1.2.1.0. First time I build the EAR and deployed it to my test server all went OK.
As you see the file contains a German special character ‘ü’. It turned out that an EAR file should not contain files with special characters in their name. I did not test this on a WLS running under Window, as I don’t have one installed, but I guess it’s working there as I did not get this error running the application on the integrated WLS under a WIN 7 64Bit system. Based on some posts on the OTN JDeveloper forum this article shows how to implement a custom fdormatter class to use with ADFLogging and how to integrate it with the embedded WLS instance in JDeveloper. Sample workspace for the custom logger is available at the end of the article. As the model shows the formatter is used by the log handler which gets a log record and processes it by piping the record through a filter and then through a formatter to finaly pass it to the attached output target. In most cases the output target is a file, a db table, a system log or a stream. For the console logger its most often a stream (e.g. stdout and/or stderr). As you see there is more information printed, e.g. source and line number and log level. As this creates long log lines I made this customizable. How the parameters are passed to the logger is shown later. which gets a log record and returns a string of the information which send to the handler for further action. The format method checks the parameters given and returns a string according to them. Now I add a new logger by clicking the green ‘+’ sign and specifying the log level and the name of the logger, which is actually the part of the class path the logger reacts on. To add this you need to change to the source view for the logging.xml file. I have to set the useParentHandlers to false to prevent that the messages get printed multiple times. To be able to analyze the messages with the log analyzer I add the ODL handler too. Now all log messages are printed to the console and to the ODL logger. Now that the logger are setup in the logging.xml all I need to do is to make the classes available to the WLS instance. For this I build a jar from the project and put the resulting BlogConsoleFormatter.jar in a folder where WLS picks it up while starting. There a a couple of folder, but I choose <ide.system.dir>/DefaultDomain/lib folder. ide.system.dir is also known as the systemfolder of your JDeveloper installation. If you don't know where to find it check this blog. 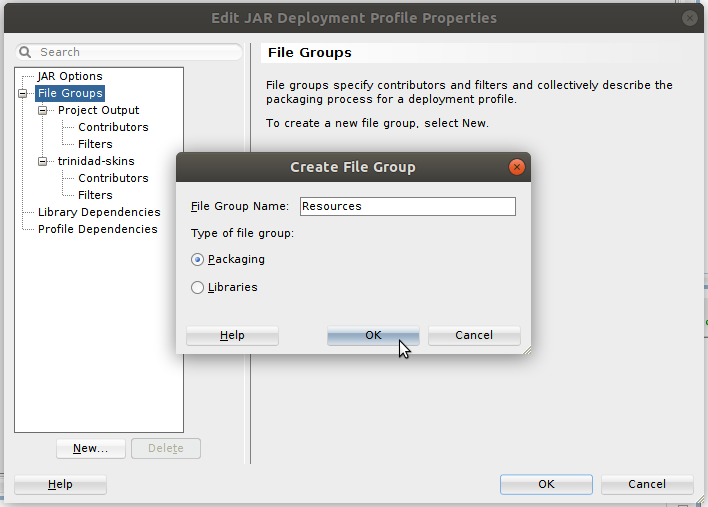 You can either copy the jar into the folder or setup the deployment profile to generate the jar in this folder. The picture above show a small code sample with the generated output from DebugFormatter. As you see the log lines are marked as links. If you click on such a line you see that you are transfered to the code location of the message. You can download the source code for the BlogLogConsoleFormatter.zip and a BlogPopupRegion.zip using the ADFLogger to generate messages in different log levels. After downloading the files you need to remove the ‘.doc’ suffix and rename them to ‘.zip’ as the files are normal zip files. 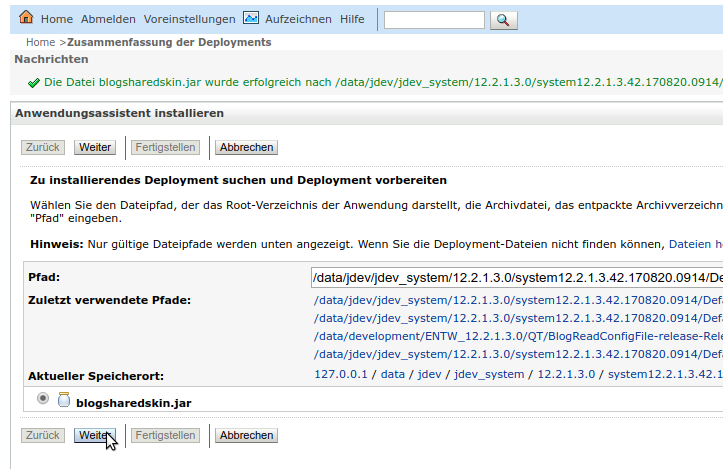 The sample workspaces are developed with JDeveloper 11.1.2.0.0, BlogPopupRegion uses the HR schema as DB connection. The last couple of days more people are trying to run ADF applications build with JDeveloper of version X on a Weblogic Server with a different ADF Runtime version Y installed. To make it clear, this will not work! 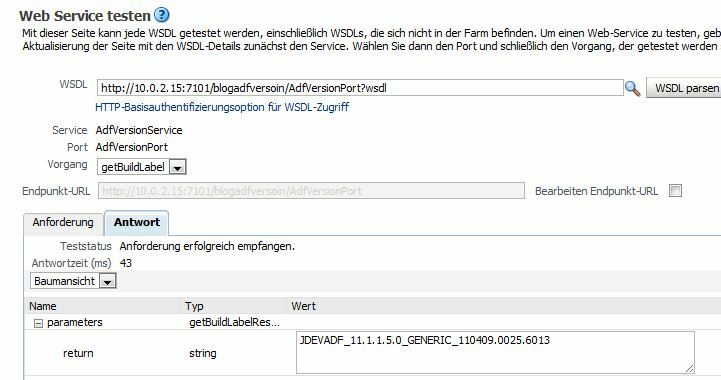 You need to make sure that the ADF Runtime versions of JDeveloper and Weblogic Server match. 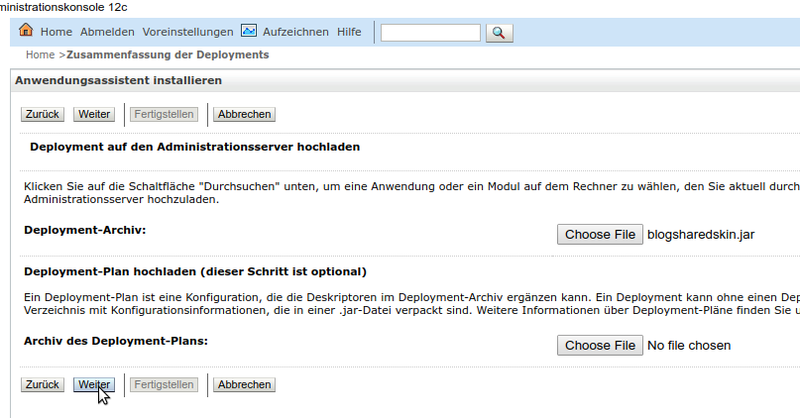 Next thing is that you can’t install the ADF Runtime on any Weblogic Server you like. The ADF Runtime will only work with a specific Weblogic Server. 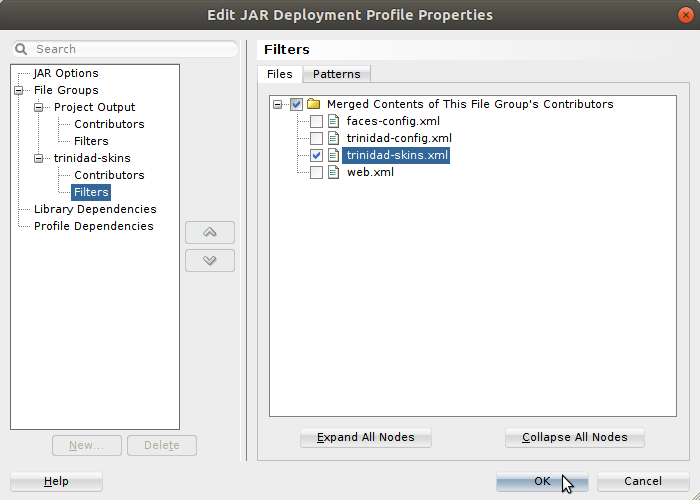 As each JDeveloper version comes with its own ADF Runtime version, there is a direct connection between JDeveloper and Weblogic Server. Important Note: there are two releses of JDev 11.1.1.6.0 out. The first one release Feb 2012 (Build 6192.1) and the second one Nov 2012 (Build 6229). Both use the same ‘ADF Runtime Installation’ so there in no new ‘ADF Runtime’ installation available or needed. Read Release Notes for more information on this. 12.1.2.0.0 12.1.2.0.0 WLS 10.3.5+ can be used if no ADF is used in the application! 12.1.3.0.0 12.1.3.0.0 WLS 10.3.5+ can be used if no ADF is used in the application! There is no backward or forward compatibility! You don’t need to try, I’ve tested most but not all combinations and run into trouble whenever I mixed versions. 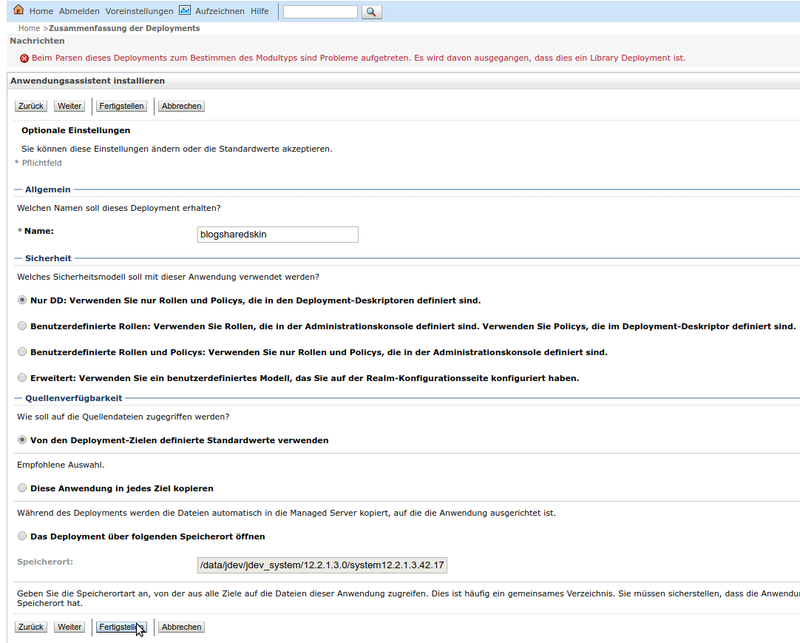 For my tests I used used a small ADF application based on the HR schema.The UI consists of an af:query with a panelCollection for the result table and abounded task flow for editing a row in a popup. The application was build on JDeveloper under Window 7, the resulting ear file was deployed (using the WLS console) on the Weblogic Server on a Linux box. The ADF Runtime installed on the WLS was downloaded from here. The WLS installed on the Linux box was downloaded from here. I used the “Oracle WebLogic Server 11gR1 (10.3.5) + Coherence – Package Installer” and installed the WLS without Coherence. After installing WLS the ADF Runtime installation was applied.